This month’s E-Blink Showcase is chock full of unbelievable bargains for users of Refreshable Braille and Accessible Mobile technologies. Blame it on the August heat, but Flying Blind, LLC has managed to secure some crazy-low discounts on the following Technologies! Two Alva Delphi 440 Refreshable Braille Displays! This state-of-the-art Braille Terminal was the first Braille Display to implement the use of two rows of touch cursors for added functionality from the Braille display. Flying Blind, LLC has two of these 43 Braille Cell Displays on sale this month. This product has a suggested list price of $5,195.00 USD, but Flying Blind, LLC is offering both displays for the unbeatable price of $895.00 USD per Display while supplies last! Both Braille terminals come with a one-year extended warranty from the time of purchase, have undergone a comprehensive check-out, and are warrantied with VisionCue in Portland, OR. VisionCue distributes and supports Optelec's products for the blind in both the U.S. and Canada. Two Alva 544 Satellite Classic Braille Terminals! This Braille Terminal is the first Braille Display to combine Alva’s ergonomic Satellite Keypads on either end of the Braille Display to provide limitless functionality and navigation options throughout Windows applications. Flying Blind, LLC has two of these 40 Cell Braille Displays on sale this month. The Satellite’s suggested list price is $5,495.00 USD, but Flying Blind, LLC is offering both displays for $2,950.00 USD per Display while supplies last! Two Accessible Pocket PC Cellular Phones! Flying Blind, LLC is excited to offer to its customers two accessible Windows Mobile PDA Phones with the latest version of Code Factory’s Mobile Speak Pocket software preinstalled on each phone. Flying Blind, LLC has one Cingular 8525 with Mobile Speak Pocket preinstalled. 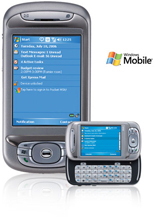 Flying Blind, LLC also has one T-Mobile MDA Windows Mobile Phone with Mobile Speak Pocket preinstalled. Both options provide the end user exceptional access to the Windows Mobile Operating System as well as the ability to utilize all of the benefits of either the AT&T or T-Mobile wireless networks. Both phones plus the Mobile Speak Pocket Screen Reader have a suggested list price of $995.00 USD per device. Flying Blind, LLC is most pleased to offer this turn-key solution for only $500.00 USD per device! Incredible pricing for Mobile Speak Pocket Screen Reader! Flying Blind, LLC has been able to secure pricing whereby it is able to offer its customers a $350.00 USD price on Mobile Speak Pocket, the world’s first screen reader that makes hundreds of PDAs and cellular phones accessible to those of us who are vision-impaired! This discounted price is currently $245.00 USD off of the suggested list price of $595.00 USD. So contact Flying Blind, LLC to assist you in your efforts to access many of today’s popular mobile applications! Order requests and/or questions regarding any of the products listed above may be directed to: E-Blink@Flying-Blind.com. If you represent an agency, organization, or manufacturer who wishes to have your previously operated equipment represented in a future E-Blink ShowCase, please contact us at E-Blink@Flying-Blind.com to discuss placement within this section for future E-Newsletters.